Two public health experts delivered presentations Feb. 4 to a packed audience at the Violent Conflict, Refugees and Health event that examined the role public health plays in violent conflict. Kaveh Khoshnood, an epidemiology associate professor from Yale University, gave a presentation called “The Role of Public Health in Prevention of Violent Conflict,” which examined how public health education can be transformed to give students the tools to look at how violent conflict affects human populations. Khoshnood’s training is based in epidemiology, the spread of infectious diseases. He developed a secondary interest in ethical issues and violent conflict in research, which sparked his desire to adapt public health into a tool to analyze and possibly prevent violent conflict. According to Khoshnood, current public health education focuses heavily on self-directed violence, such as self-harm and suicide, and interpersonal violence, such as domestic violence and homicide. However, there is a third type, collective violence, that he believes is not getting enough attention in public health education. Collective violence is the type of violence we see in wars and other violent conflicts; it is defined by the World Health organization as people who identify as a member of a certain group that commits violence against another group of people. Khoshnood took a sample of 6,000 public health classes across the top 20 public health schools in the United States, and only 0.5 percent of them had the word “war” mentioned in their syllabus. Khoshnood’s hope for future public health education is to ultimately use the profession to identify risk factors for conflict and reduce or eliminate it entirely. In the past, public health officials have advocated for temporary ceasefires to deal with health crises. However, these temporary ceasefires lead to peace talks between conflicting factions that contributed to the end of the conflict. Khoshnood hopes that public health education teaches students about violent conflict and how public health professionals can play a role to reduce the humanitarian damages of the conflict. The second speaker of the event was Kamiar Alaei, who is a visiting professor at the Dornsife School of Public Health at Drexel University. 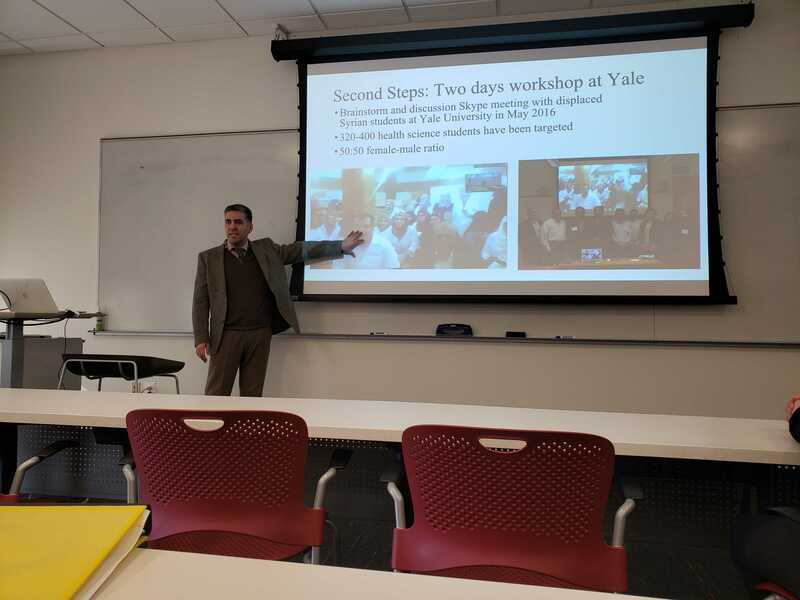 His talk, “Global Health Education in Conflict Zones: Rights of Internally Displaced Syria Students to Health Education” looked at Alaei’s own efforts to set up educational infrastructure to college-aged students who have been displaced by the Syrian conflict. There are about 200,000 Syrian students who qualify for education, but are unable to receive it due to the ongoing conflict in their country. Many of these students lack access to electricity and desktop computers, which are necessary for traditional online educational infrastructure. Alaei and a group of educators all over the world have been working on developing a mobile smartphone app that allows students to receive online health education. There have been many hurdles they have encountered along the way. For example, although they have been able to find Arabic speakers to translate course content, Syria is unique among Arabic-speaking countries in that they have their own medical terminology. As such, they had to find a Syrian professional who knew the specific terminology to translate the content they needed. The next steps for Alaei are to scale up the infrastructure to increase accessibility of the content. Since there are governmental blocks on internet content, Alaei has been working with a technology start-up that allows content to be streamed from satellites, which can then be broadcasted in a short radius to different devices. Additionally, due to students’ lack of access to a consistent source of electricity, the group is working with another company that develops portable, solar-powered generators that can be used to charge devices. After their talks, both experts called for more interdisciplinary work between public health and other disciplines. They emphasized that many other disciplines are more than willing to contribute to public health education, and that the perspectives offered by other disciplines can be vital in developing diverse and extensive content to teach to future generations of public health students.